Some 15 million households with 40 million people struggled to afford enough food at some point in 2017, new Agriculture Department data show. That’s about 11.8 percent of households that experienced food insecurity — those in which some members struggled to afford adequate nutritious food at some point during the year. These data are an important reminder to lawmakers drafting the final 2018 farm bill of how many Americans continue to struggle and why SNAP (formerly food stamps) is so important. Studies have shown that SNAP reduces food insecurity, which can have important impacts on health and well-being. Cutting SNAP, as the partisan House-passed farm bill proposes, would only put low-income households at greater risk of food insecurity. The share of food-insecure households rose significantly due to the Great Recession and its aftermath, rising from 11.1 percent in 2007 to a high of 14.9 percent in 2011. 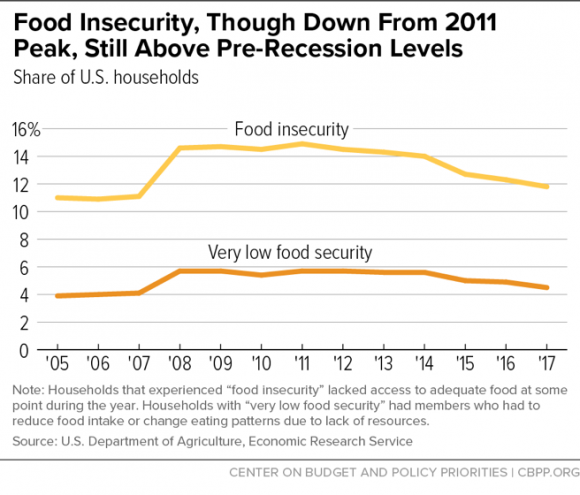 While food insecurity has declined since then, it remains above pre-recession levels. Households with children have higher rates of food insecurity: about 15.7 percent of households with children, and 16.4 percent of households with young children, were food insecure in 2017. Though parents and other household members often protect children from food insecurity, children experienced food insecurity in about 2.9 million households with children (7.7 percent of such households), and 540,000 children lived in households where children experienced very low food security. These figures are particularly concerning given that food insecurity in childhood is linked with a number of negative outcomes for children. The declines in food insecurity are promising, but also show that despite many signs of a strong economy, millions of Americans continue to struggle to meet basic needs. Nearly 40 percent of Americans reported difficulty meeting at least one basic need (including food, health care, housing, or utilities) in 2017, according to a recent Urban Institute study.